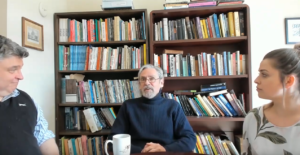 Watch and listen to this Atlantic School of Theology podcast as Kenn Stright, a retired Presbyterian Minister, past KAIROS Atlantic Regional Representative, and member of the planning team for Streams of Justice: Atlantic Gathering 2019 discusses faith and activism and the unique ways that KAIROS is helping to build a more just and sustainable world. Streams of Justice will bring together experienced and aspiring grassroots activists (all newbies welcome!) from across the Atlantic. This 3-day intergenerational Gathering will build the Atlantic ecumenical social justice movement, increasing participation, diversity, effectiveness and commitment. It is an opportunity to delve deeper into the social justice commitments that are close to your heart, in the company of others equally committed to working for positive change. For the audio version, click here. Join us at Streams of Justice!